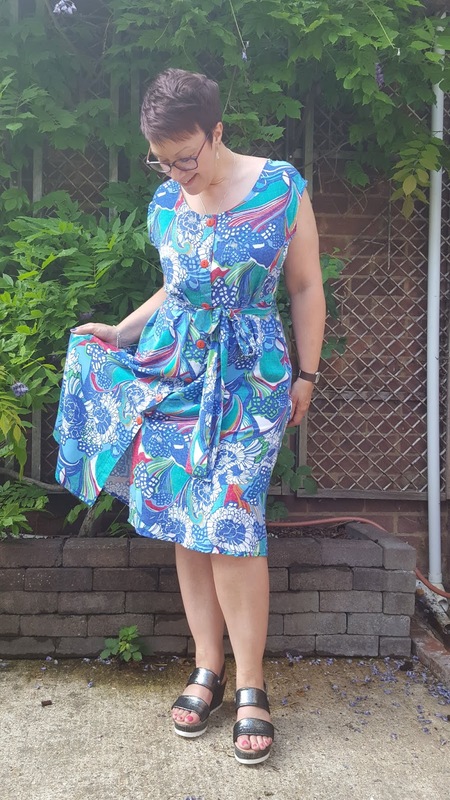 With the weather turning as hot as it has been recently I discovered a distinct lack of work - appropriate dresses in my wardrobe. I knew I wanted to make a couple but couldn't decide on a pattern. I've had a love of loose shirt dresses develop over the last few months, but they tend to be a bit shapeless and not necessarily the most figure flattering. 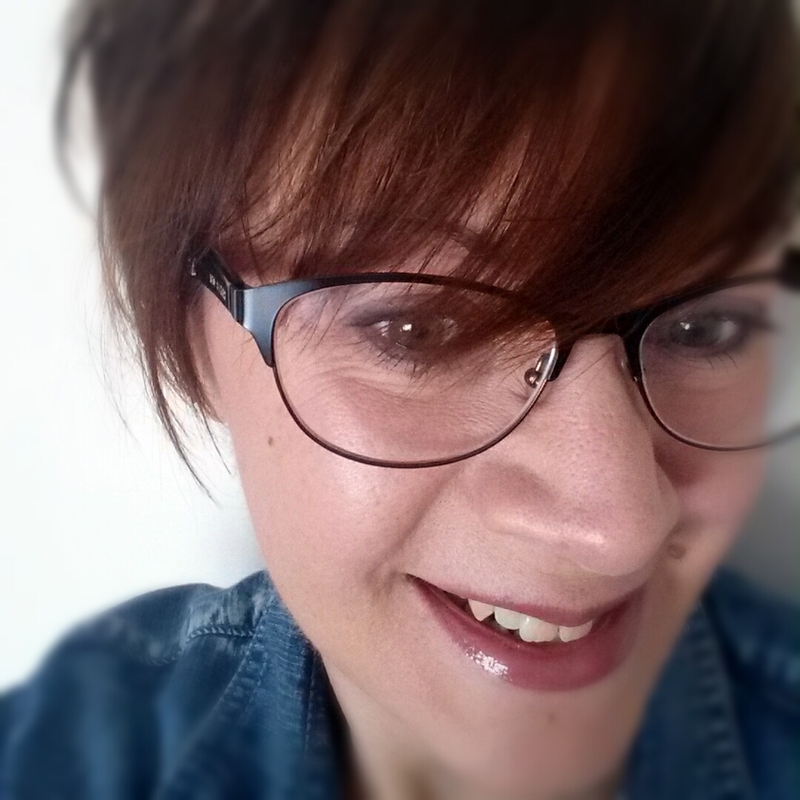 I wanted something loose-ish but not so loose it was sacklike. 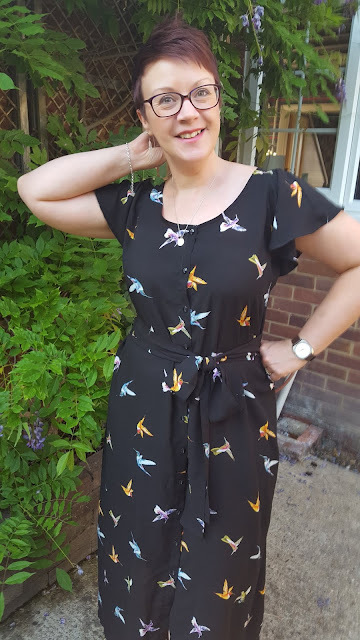 I couldn't decide which pattern to use, but then I remembered a black linen dress I made a couple of summers ago (I think) based on the Lily Sage and Co Branson top. I quickly reprinted the pattern and taped it together, then dug out my fabric. 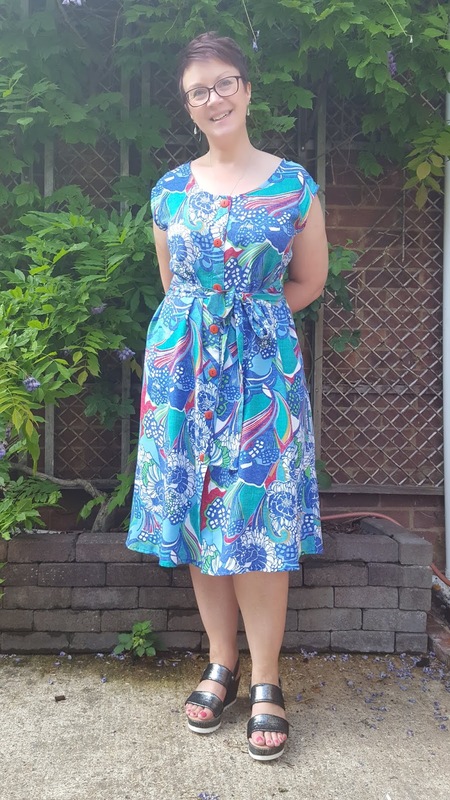 For my first dress I used some lovely drapey viscose challis I bought recently from Minerva Crafts. It's a really nice weight and the colours are gorgeous; I'm tempted by one of the other colourways as well. In terms of the pattern, I cut the bodice back as per the original pattern, albeit taking an inch out of the height to account for my lack of height. For the back skirt I lengthened the back peplum by 18 inches. 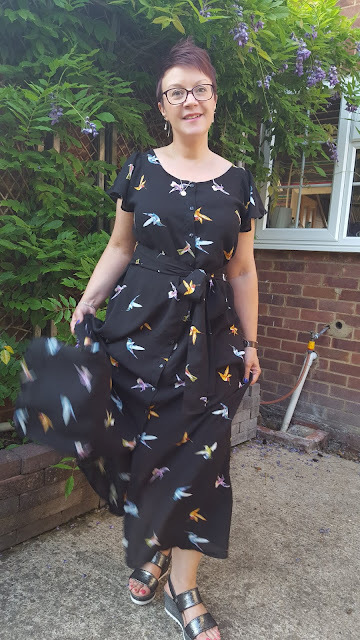 The front is all one piece - as in not separate pieces for bodice and skirt - and this I lengthened by the same 18 inches after smoothing out the dipped hem at the centre front. Construction-wise I followed the pattern directions, but from my last one I found I could get it on and off without undoing the buttons, so this one has no buttonholes. The buttons are sewn through both front bands, which is incredibly lazy I know! I was pleased to find I had exactly the right bright orange buttons in my button jar. The second one I made has turned out a little fancier than I planned. I probably wouldn't wear this one to work, but I'd wear it outside work for anything from a casual walk to the local pub to a fancy birthday party. In fact I'm planning on wearing it to a 70th birthday party this coming weekend. The fabric is another viscose, this time from Barry's in Birmingham, purchased quite recently. It's thinner and not quite as nice as the previous fabric, but at £4.00 a metre I can't complain! 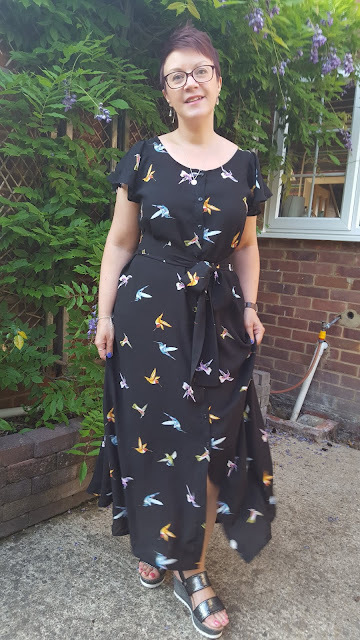 I decided to maxi-fy this one; I'm not quite sure how much length I added on I'm afraid, enough to make it ankle length on me. I also decided to do a little something different with the sleeves. 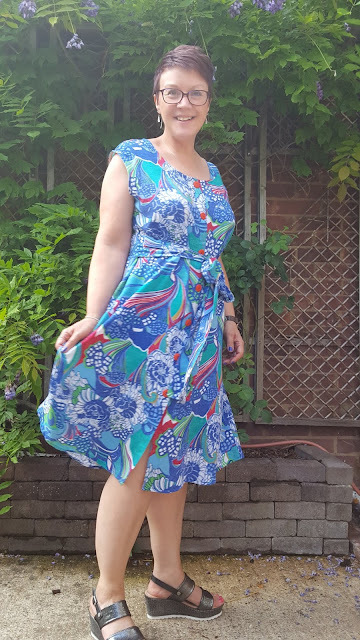 I had the Burdastyle Alexander blouse pattern in my stash, so I decide to use the sleeve from that for this dress. The sleeve is actually cut as part of the bodice and gathered into a kind of dart, so I overlaid my two patterns and traced a new shoulder/sleeve. Luckily the sleeve blended really easily into the underarm/side seam junction on the Branson bodice. Again I cheated and didn't make buttonholes. I don't hate making buttonholes quite as much as I used to, but I'd definitely avoid making them if at all possible. I'm trying to stop myself making another dress using this pattern as a basis and move on to something else. I'm off to Portugal in September and could do with some holiday clothes. I don't do shorts, but I'd love some flippy culottes I could make at around knee length, and I've got a desire for a loose strappy jumpsuit. Any pattern recommendations would be greatly appreciated!